The presence of a class of McDonald's global brand reinforces Manado as a world tourist destination in eastern Indonesia. While the other side, its presence also means that support the region's economic growth through workforce engagement, as well as a choice location Menado family to spend time together. The potential of the city of Manado in terms of tourism has been recognized by many, inside and outside the country. So, add one culinary delights that have been familiar to the tongue of foreign tourists will make them more comfortable and feel "feel at home". That is one speech given by Mr. Sukowati Sosrodjojo, President Director of PT Rekso National Food (RNF) in opening outlets that took place today in Manado. 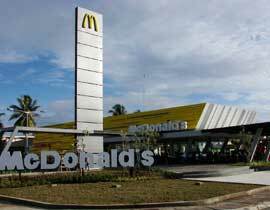 Located in the Boulevard area, where tourists used to cross to get to the island of Manado Tua and Bunaken's most famous locations, McDonald's has become the first presented by RNF - Developmental Licensee McDonald's restaurant in Indonesia - in this province. Mr Sukowati Sosrodjojo, President of McDonald's Indonesia - PT Rekso National Food said "We are very enthusiastic and optimistic about the development of investment climate in Manado. This province is preparing itself to be one ecoturism best tourist destinations in Indonesia, especially with a series of international activities that have been and will be implemented. Of course this will attract more foreigners to visit, for business, meetings or leisure travel. That's why McDonald's decided to come here and give one more factor that could become the pride of residents. Making beats McDonald's part of the community of Manado, because we are also committed to contribute the maximum to the community around. " Adapting culture Manado sea, with ship-shaped building facades are getting towards the sea, McDonald's Manado built on a land area of 2700 square meters. Desk facing the sea is a cool place to hang. Plus the concept of service facilities 24 hours, 7 days a week, Drive Through, Party Room, Play Land, Internet Corner, and has Wi-Fi access free of charge, then complete the effort to embrace all the needs of customers of various ages and interests. In this happy occasion, McDonald's Indonesia to invite the entire community invitation and participated Manado enliven the event with dancing to Chaka-Chaka dance movement which is a "line dance" the pride of the people of Manado. "National Food Rekso helped preserve and revive the local culture. Make it a special part in every activity of the company. But that privilege is that of any participants who participated in the program Bagoyang Dorang dancing Donate follow-Chaka Chaka dance, McDonald's will donate a certain amount. So we hope the audience will all want to come to dance, "as presented by Rini T. Wardani communications manager for the National Rekso Food. Overall donations collected will be donated to the Foundation Ronald McDonald House Charities, a nonprofit corporation which is a legally separate institution from McDonald's. This institution has a goal to help children less fortunate have the opportunity and basic health facilities are better for free. Torang spirit Samua Basudara, the potential areas in the future, as well as strengthen the warmth of its people more confidence and commitment of the National Food Rekso to serve and provide the best of McDonald's to the people of Manado, so I'm lovin it more real.